Get a rare glimpse into the relationship between author A.A. Milne (Domhnall Gleeson), creator of the beloved Winnie-the-Pooh stories, and his young son Christopher Robin (Will Tilston). The international success of the books that enchanted the world comes at a cost to the author, his son, and his wife Daphne (Margot Robbie), in this moving story about success and family. 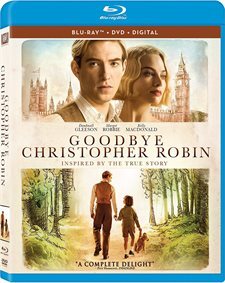 Download Goodbye Christopher Robin in Digital HD from the iTunes store. Goodbye Christopher Robin images are © Fox Searchlight Pictures. All Rights Reserved. He was just a little boy and his bear living in the countryside of England. Who knew the stories of his moments at play would eventually become the most beloved book of all time. Not only did they bring a country, and the world, back from the depressing post wartime but also they have endured for almost 100 years. Unfortunately, for the real Christopher Robin (newcomer Will Tilston and Alex Lawther; Black Mirror) the stories thrust him into the spotlight as a child and he quickly grew to resent them. 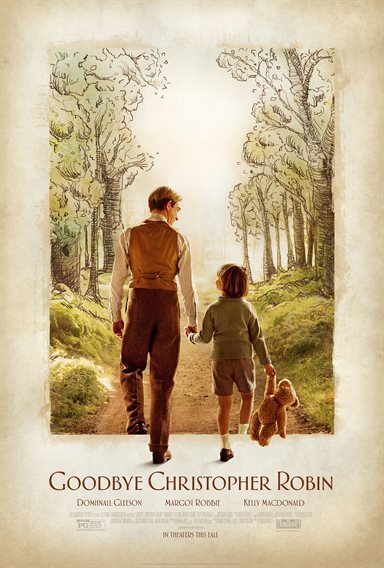 Goodbye Christopher Robin explores the tenuous relationship the young boy had with his parents, especially his father, acclaimed author A.A. Milne (Domhnall Gleeson; Star Wars: The Last Jedi). Alan Alexander Milne was back from World War I but having a difficult time reacclimating to normal life. He and his wife, Daphne (Margot Robbie; Suicide Squad) lived in London's West End where Milne was a successful playwright. After their son, Billy Moon (Christopher Robin) was born, Milne's anxiety became worse and the trio moved to the woods in Sussex. Being of the Edwardian era, the Milnes' were not "hands-on" parents and they brought their Nanny, Olive (Kelly MacDonald; No Country for Old Men), to look after the young boy. However, when Daphne went back to London and Olive returned, as well, to take care of her ailing mother, Milne found himself alone with Billy Moon. At first, he was unsure of what to do and awkward but eventually, the two started to bond and played in the woods surrounding their home. It is there they made up the stories that went on to become the foundation for the world-famous novels. However, as the books became more popular, everyone wanted to meet the "real" Christopher Robin and his life of obscurity all but ended at the tender age of eight. Tilston is quite remarkable for never having acted before. He embodies an innocence that translates into the books. Gleeson is masterful as the elder Milne. He is stoic and guarded with moments of gentleness and the occasional panic attack when he encounters one of his PTSD episodes. Robbie offers up a solid performance as the cold, seemingly heartless mother who would rather escape from her child than show some affection. MacDonald is a beautiful accent to the young Tilston and they play off each other well. The cast, overall, is what makes this film special and brings this somewhat fictional story to life. The Blu-ray combo pack offers both the Blu-ray and DVD disc as well as a digital download. The 1080p high definition video quality is incredible especially the lush greenery of the 100-acre woods. The colors are vibrant and lively and the now infamous red balloon stands out amongst all the green and brown of the forest. The DTS-HD Master audio 5.1 is sharp and clean with the dialogue standing out in the center channel. The effects, though minimal, do a good job of filling all of the surround speakers, especially during the war sequences. The Blu-ray has several extras including commentary by Simon Curtis and Frank Cottrell-Boyce, Theatrical trailer, photo gallery and a series of promotional shorts that highlight the cast, the story and the Characters. Some of them are redundant but all give a glimpse inside making the movie. If you grew up with Winnie-the-Pooh and loved the character and stories, then you will enjoy learning the backstory behind the author, his son and the process as to which brought he beloved bear and his friends to life. The film is worthy of watching, especially for the acting and the storyline. Peaking into the inspiration behind these books will make you view them in a whole new light; hopefully, a favorable one.